• PLOT SUMMARY: Cover by Amanda Conner. "Unleashing the Beast" Written by Jimmy Palmiotti and Justin Gray. Art by Amanda Conner. As the Ultra-Humanite holds Manhattan and Power Girl hostage, he tells the parts of his origin that have never before been revealed. 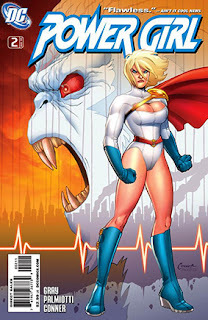 And what Power Girl learns chills her to the bone.